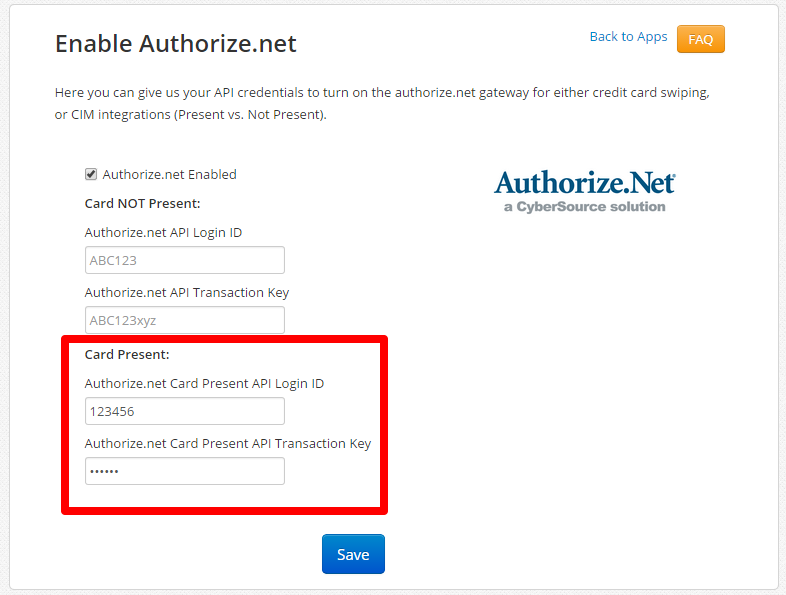 Authorize.net is another option for users who wish to stick with their current credit card processor or prefer it over Vantiv. Because Authorize is not EMV chip compliant we have removed this option from the App Center to discourage users from integrating with them. However, if you would still like to proceed with this payment integration let us know and we will provide a special link for you to access the card and complete set up. NOTE: We have been told that Authorize.net only gives out a "Blended Account" now that supports card present and card not present. It is recommended that you get a blended account with them. If you do so either set of these instructions will work for you and you can do both, swipe and store credit cards. You are aware that you need a blended account(card present/not present) to key in and swipe cards. You have the option to opt out of a blended account, but you will need separate Authorize accounts to handle card present or not present transactions. 1. Go to their website and signup (or call them). You are looking for: "Card Not Present - Internet(e-commerce,web site, etc)" as the account type. 2. When Authorize.net says your account is "Live" this means your gateway is ready. But it doesn't necessarily mean that you can process transactions. You must be connected to your merchant account as well. Contact your merchant account provider and tell them you will be connecting to authorize.net. They will use some internal lingo like "Great, we'll build you an authorize.net profile" and they will give you some information like a "Terminal ID" and related information. 3. Contact authorize.net with the terminal ID and related information to complete your gateway configuration. 4. 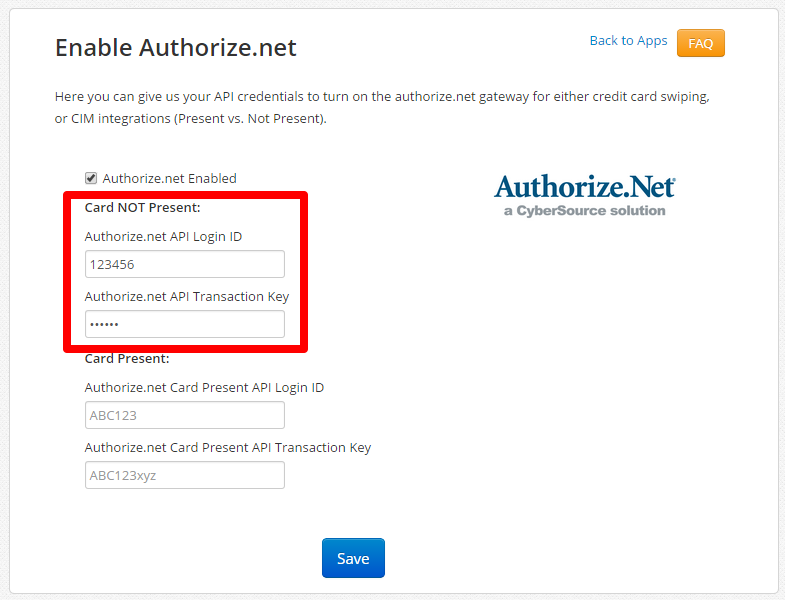 Visit the 'Account' tab of your authorize.net account, and click API Login to get the API login and password. 5. Create a login and transaction key. This is what you will enter in the integration settings. 6. Visit the 'Admin' section of the software and click 'App Center'. View the Authorize.net App. Enter the API Login and API Secret in the settings fields. You are all set! If you run into any issues or errors please refer to the troubleshooting steps below. "Card Present - Retail(point-of-sale)" as the account type. 2. Contact your merchant account provider and tell them you will be connecting to authorize.net. They will use some internal lingo like "Great, we'll build you an authorize.net profile" and they will give you some information like a "Terminal ID" and related information. You are ready to swipe! Get your generic USB swiper from the supported hardware section here. Go to Admin > Reports > Payments > Payments Report. Once here, click "View" on your recently failed transaction. If you see an error 103, 3, you will need to get a new Transaction Key from Authorize.net. After doing so, paste this new key into your Admin > App Center > Authorize.net settings to apply. If you receive a "A duplicate transaction has been submitted." error when intentionally trying to process the same card for the same $ amount, wait two minutes and try again.